Watch for these warning signs that home care is needed this holiday season. 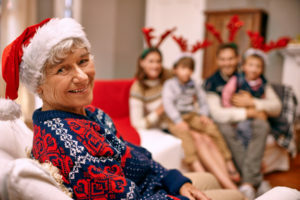 From the minute the door swings open and your elderly loved one wraps you in a warm hug, through the festive holiday meal and every timeless family tradition, opportunities abound for not merely quality time together, but to assess how your loved one is really doing and if any red flags are noticed as well. Social differences. According to John Ramsay, CEO of Shift 8, “Dementia can cause people to become closed-off, avoiding any sense of social interaction.” Look closely at any signs both in the senior’s behavior and conversations that point to his or her inclination for reclusiveness and isolation, particularly if the person has consistently enjoyed socializing. Mood swings. Depression, anxiety, and apathy tend to be components of early onset dementia. The disease impacts a person’s ability to process and manage emotions, often times caused by the inability to recollect what triggered a negative feeling, leading to increased irritation. Loss of memory. Difficulties with memory are at the core of Alzheimer’s disease, in particular, short-term memory. Note if the senior generally seems to have trouble with recent events, but is able to fully engage in discussions about the past. Issues with altered routines. Spotting disorientation, anxiety or agitation is not uncommon through the holiday season, with its probability of disruptions to the normal routine. Those with Alzheimer’s have a tendency to rely heavily on familiarity and could appear out of sorts when deviating from the usual. Physical differences. Note any proof of a decrease in hygiene or in the cleanliness and organization of the house, especially if your senior loved one has until now been meticulous in maintaining a sense of order. Any worries such as these should really be brought to the attention of the senior’s primary care doctor as soon as possible. And, it is important to have a trusted senior care partner readily available who knows the nuances of dementia and other concerns of aging, and that can supply the professional assistance which enables older adults to remain secure, safe, and well. Call Home Sweet Home In Home Care at (269) 224-1683 to learn more about our highly skilled, specialized Kalamazoo, MI dementia care team as well as for an in-home assessment to learn how we can help. Click here for a list of our full service area.